Dr. Phil shared the story of a woman – who after learning of her husband’s affair – had 5 affairs of her own, distracting herself from the pain of his affair by jumping into affairs of her own. 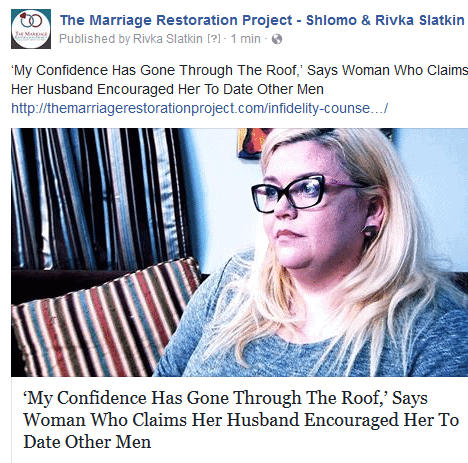 “My confidence has gone through the roof,” says woman who claims her husband encouraged her to date other men. How to Fix a Marriage After a Case of Infidelity: Read more to make this process easier. She’s a mom of 3 kids, had low self esteem all her life, and now claims to enjoy a new-found self confidence created by attentions that are bestowed upon her by men (even while still married). Her soon to be ex-husband encouraged her to go out with these men, even while married, to distract her from the pain that he caused her. What we can all learn about affairs. 3. Decisions to be made about how you’d like to go forward for yourself, your healing, and your children. Couples can heal from affairs. It depends if you want your marriage or not. It is normal if you feel so angry that you want to leave. It’s also normal that the betrayer will want to leave if he/she didn’t yet end the affair. We encourage you to learn from it and pursue infidelity counseling so that you can heal yourself and heal together, especially if children are involved, though we understand how difficult it can be to trust again. We can certainly help you with how to save your marriage after an affair and we see the best results- in cases of affairs- with our 2 day marriage therapy intensive. The 2 days we spend working together will literally pull you out of this deep despairing place into one of hope and healing. You will discover the root of the issue that led towards the infidelity, explore why the relationship went sour, what you both weren’t getting in the marriage, and what led to the betrayer to look elsewhere. Saving marriages after infidelity is what we do, is entirely possible, and we can help you do it too. Talk with us today to begin saving your marriage by way of a private intensive marriage retreat experience.